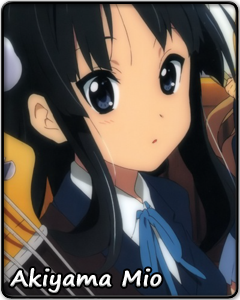 Akiyama Mio would have been happy enough belonging to her school’s literature club. Not perfectly happy, maybe, but happy enough. In her everyday life, Mio bravely endures the pranks of her childhood friend and the time spent in the zany logic zone their clubroom has become. She distinguishes herself whenever the club is in a pinch; whether it is pleading with the student council or standing in for their inept lead singer, Mio overcomes her personal fears and stands up to the task. She also takes responsibility for writing the group’s lyrics – those end up full of fluffy imagery and peculiar metaphors. Both fountain pens and curry rice are intrinsically linked with love, after all. Mio’s struggle to keep the club in one piece, and practicing, seems to be a fight against insurmountable odds. But she’s not one to give up. When all is said and done, she is the one who wants them to succeed the most.